On Fridays Jon and I don't even have to discuss our plans for that evening - it's just assumed that by 4:30 or 5:00 PM on Friday we'll both be sitting on bar stools at either Jumpin Jacks, The Gardenville Hotel, The Country Tavern, or another "townie" bar in Doylestown or New Hope. It's also our ritual to pick up a pizza on our ride home, but we weren't in the mood for that last night. Instead, I decided to look through what we had in the house and whip something up. While Jon took a quick (beer-induced?) nap, I made what turned out to be a really good pasta dish!! Even better, the total cooking time, including time to boil that water, was only 25 minutes. - In the meantime, melt butter (about 2 tbs) in a pan. Add garlic (3 cloves minced) and 1 sm chopped onion. Saute. - Add shredded cheeses (about 1 c total, mostly Asiago) and stir. 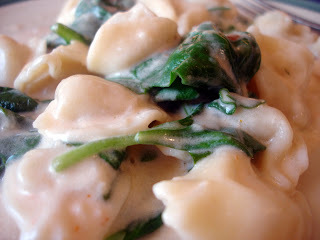 - Add 1/2 bag of fresh spinach and the tortellini. Stir until everything is coated and the spinach slightly wilts. Now that I've made this cream sauce, I'm looking forward to trying it with different pasta shapes, more veggies, and even some chicken. Looks amazing! Great use of ingredients on hand! Hi! I'm thinking of making this tonight. What other veggies do you think could be incorporated in this? I love your blog! Hi! I think you could do a bunch of different veggies - spinach and red peppers; broccoli/onions/garlic; red and green peppers; carrots and broccoli; etc. Really whatever you like. With harder veggies you will want to cook them most of the way first. Saute onions and garlic, add the veggies and cook until mostly done, and then add the veggies to the pasta mix and bake. I love it, i made it to go with an asiago tortellini that i had in the freezer, it was much better thab most of the recipes ive tried. Thanks a bunch!